The petition to stop using forest biomass for electrical power generation launched by St. Margaret’s Bay resident Helga Guderley in late February garnered over 25,000 signatures within 10 days, but could not be submitted to the Nova Scotia Legislature which requires paper petitions. So Guderley & Co. collected over 1000 names on paper and submitted the petition today, November 1, 2016. (At the time the electronic petition stood at 29,199). 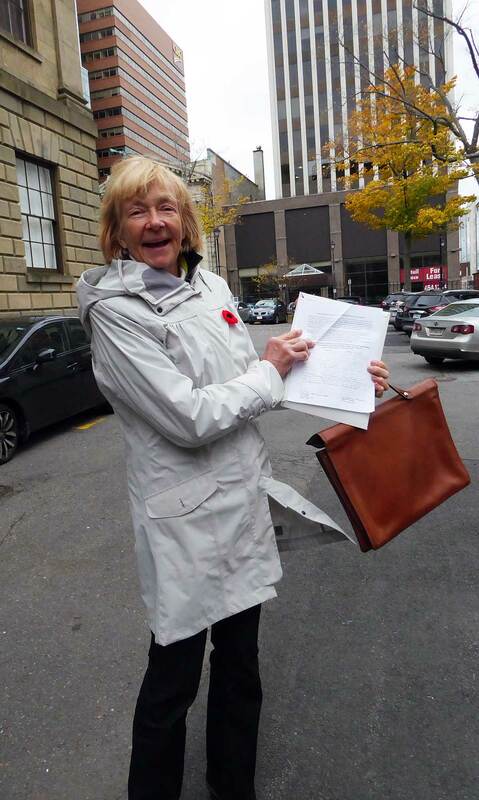 The petition was presented in the legislature by Lenore Zann, MLA for Truro-Bible Hill-Millbrook-Salmon River. Stop using forest biomass for electrical power generation! Nova Scotia’s forests are rapidly disappearing. More and more forests are being chipped and burned for electricity generation, mutilating our landscapes and reducing shelter and food resources for wildlife. Is this destruction of Nova Scotia’s forest ecosystems the “green energy” we want? In light of reputable demonstrations of impacts of full tree harvesting on soil nutrients, biodiversity, and wildlife, and because truly renewable forms of power generation are available, our current ‘green energy’ legislation must be changed. 1. Clear cutting entire forest stands for electricity generation is the lowest end use of our forest resources and prevents diversification of the forest economy with eco-friendly and value-added industries. 2. Clear cutting for biomass energy production is harmful to wildlife habitat, water cycles, soil nutrients, carbon storage and the chemistry of nearby waterways. 3. Biomass energy derived from primary harvesting increases carbon emissions for as long as 50 years, when we need to reduce our carbon footprint now. Premier McNeil, please end the use of forest biomass for power generation, as demanded by more than 28,000 people who signed an electronic version of this petition. The success of the petition elicited a Bruce McKinnon cartoon, and likely contributed to or at least speeded up the Nova Scotia Government decision to stop the Must-Run provision for the Pt. Tupper Biomass plant. Perhaps most significantly, the petition mobilized a lot of public discontent around clearcutting in Nova Scotia which led to the formation of the Healthy Forest Coalition.